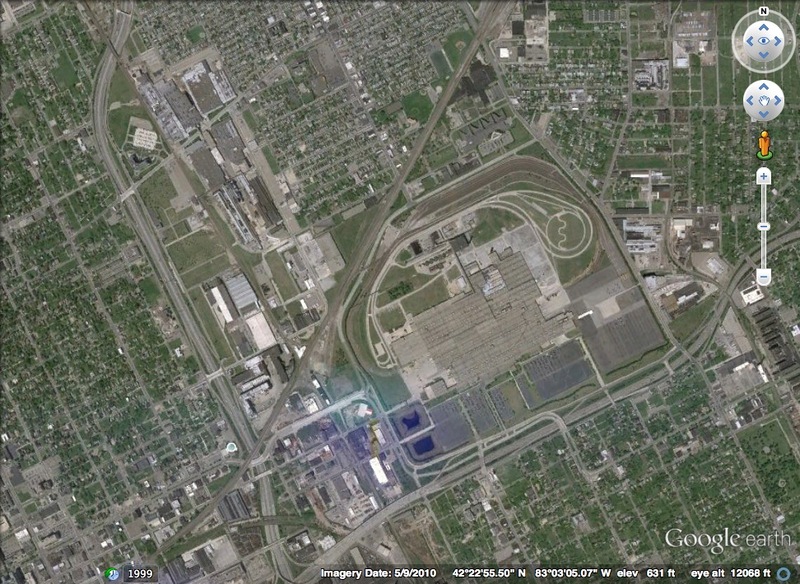 Contemporary Poletown as seen using Google Earth on November 30, 2013. The area condemned in the case is shown in the center of this photo. It’s roughly rectangular with a flattened corner on the upper left side. In an earlier post, I discussed some of the property-law underpinnings of a case coming before the Supreme Court in its October 2013 term, Township of Mt. Holly v. Mt. Holly Gardens Citizens in Action, Inc. There I discussed the family resemblance between Mt. Holly, and some takings cases: Kelo v. City of New London, Hawaii Housing Authority v. Midkiff, and Berman v. Parker. To briefly recap, the Mt. Holly case concerns an economic redevelopment plan for a particular neighborhood (“The Gardens”) in Mt. Holly, NJ. Approximately 75% of the residents of The Gardens are African-American or Latino. The redevelopment plan is not being contested on the grounds of a taking of property (Berman and Kelo clearly allow for it, rightly or wrongly), but rather on Equal Protection grounds. That is, the redevelopment plan is alleged to disproportionately affect racial and ethnic minorities – the paradigmatic “suspect” classification scheme in Equal Protection doctrine. That question of law is not immediately relevant to the interests of this blog, but it does relate at a more basic level: property is an important medium for structuring social (and by extension, political) interactions. What is particularly relevant for my purposes here, is that the allegedly unconstitutional policy being pursued by the city of Mt. Holly is arguably only possible because of the Court’s decisions in Berman v. Parker, Hawaii Housing Authority v. Midkiff, and Kelo v. City of New London. In these cases, the Court has essentially agreed to uphold any use of eminent domain that is not motivated by a “bare desire to harm” those targeted by the takings. As a result, property can be taken for a wide range of purposes – virtually any a legislature could conjure – including economic development. Indeed, economic redevelopment not only if property is physically blighted, but even if it is merely deemed economically obsolete by a legislature. It is well-known that political power in the United States is not distributed equally. Research has demonstrated again and again that those relatively less affluent and the relatively less educated participate at significantly lower rates than their more educated, more affluent counterparts. (This phenomenon is not limited to the United States, of course. Fred Solt has given us empirical evidence suggesting this is a cross-national phenomenon: see here and here.) For numerous reasons, including self-selection, institutional and structural constraints, and interactions with the criminal justice system, racial and ethnic minorities tend to participate at lower rates than whites (not coincidentally, minority status tends to correlate negatively with education and affluence). Differential levels of participation means differential levels of political influence – in short, the poorer and the less informed, which often includes significant minority populations tends to have less political influence than the relative size of their population would merit. [If you’re interested in the factors that contribute to differential participation rates, the classic statement is found in Verba, Schlozman, and Brady’s Voice and Equality.] This fact is related to both taking policy and the Equal Protection claim being made in Mt. Holly. Very briefly, laws that classify on the basis of race (e.g. de jure segregation, anti-miscegenation statutes, affirmative action, etc.) are subject to “strict judicial scrutiny” under the Equal Protection clause because racial minorities have not historically received a “fair shake” in the normal political process [an excellent discussion of this point can be found in John Hart Ely’s classic book Democracy and Distrust]. But, back to property issues: it has often been alleged that government taking schemes disproportionately harm the poor – and especially minorities. The logic of the claim is straightforward. First, blighted areas are almost by definition “poor.” As I’ve noted though, that the modern practice of blight policy departs substantially from the word’s traditional denotation. This brings up the second point, which interacts with the first: when an area is declared blighted and subject to condemnation (whether it is “blighted” in the conventional sense or not), poorer communities, and communities consisting of large racial or ethnic minority populations, are less successful at fighting policy adverse to their (property) interests. Thus, minority populations are vulnerable to abuse under modern eminent domain doctrine in that they 1) are more likely to be targeted by redevelopment efforts, and 2) are less able to resist adverse policies through conventional political processes. One reason that citizen-activists (and parties working on their behalf) are having to raise such tenuous disparate impact claim is precisely because the “public use” clause of the Fifth Amendment has been rendered nearly toothless by the Supreme Court. That is, by granting almost unlimited deference to legislatures (recall that under rational basis review, a law will only be found to be unconstitutional if it is motivated by a “bare desire to harm”) local governments can exercise eminent domain with virtual impunity. As a result, individuals’ property rights have been abused – and unsurprisingly, minorities groups and the poor have been abused more often, as they are relatively less able to defend their rights in courts and legislatures. Ultimately, by gutting the property protections built into the Fifth Amendment, the Supreme Court has made it very difficult for citizens to defend their property rights in the courts – and especially difficult for vulnerable populations. In this light, it makes sense that such groups look to other parts of the Constitution for relief. For the Mt. Holly community, that other part of the Constitution is the Equal Protection Clause of the Fourteenth Amendment. As I noted in my first post built around Mt. Holly, there is one more way in which that case points to interesting issues surrounding law, property, politics, and disasters. There I discussed the particular relevance of some major takings cases to Mt. Holly. Here I turned attention to the ways in which Mt. Holly highlights persistent problems of inequality in the American political system, including the interaction of inequality and property law and policy. Editor’s Note: Poletown, discussed above, is one of the most infamous cases in eminent domain and takings law. It has been studied by many researchers interested both in redevelopment in urban settings as well as inequality. If you’re interested in seeing what the area looked like before and after the case, take a look at the photos here.